Liverpool’s premier dance festival has got off to a spectacular start – and there is another week of memorable performances still to come. LEAP 2018, produced by MDI (Merseyside Dance Initiative), takes place at various venues across Liverpool Hope’s Creative Campus in Everton between now and 12 November, along with a closing performance at the Epstein Theatre. The festival’s opening weekend has already seen a series of stunning performances involving leading names in contemporary dance such as artist Liz Aggiss, who has been re(de)fining her signature style and brand of British contemporary dance for the past 40 years. Opportunities abound for locals too, with Liverpool talent sharing the bill with choreographers and companies from the UK and abroad during the 10-day event. This year’s theme is Suffrage, marking the centenary of (some) women gaining the right to vote. In a nod to the Suffragette movement, the launch of LEAP 2018 featured a group of women in period costume, donning the purple and green of the Suffragettes and carrying LEAP Festival placards around Hope Street. This theme translates to the festival programme, with a firm focus on female performers, and pieces addressing women’s issues, such as abortion. MDI Artistic Director Karen Gallagher MBE said: “Over the years, it’s been my mission to ensure dance is seen in Liverpool and beyond, that dancers can make work in the city, present their work and, ultimately, work with us to create a dance destination. “Each time I programme the festival I think it’s the best one yet, and I didn’t think we could top last year – but we have. I’m extraordinarily proud of the programme we have created around the theme of Suffrage and am grateful to all the hugely talented dance practitioners who have embraced it to create and present some very special work. “More than ever it’s important this year to shine a light on women and what we’re achieving as leaders in our field; to be seen, to be heard, to be present. The festival opened on Friday with a two-day national conference Our Dance Democracy: Dance, Performance, Culture and Civic Democracy at Liverpool Hope’s Creative Campus, featuring performance, debates and conversations about democracy and civic responsibility, with speakers including Charlotte Vincent, “one of the most important feminist artists working in Britain today” – The Observer. Highlights over the next seven days include double bill Laila Diallo: In This Moment and Liz Roche: Wrongheaded on Tuesday 6 November at the Capstone Theatre. Canadian-born, Bristol-based dance maker Diallo’s piece touches on notions of change, remembering and forgetting and our experience of time passing, whilst Roche’s Wrongheaded merges film, voice and movement to confront the realities of women’s rights in Ireland. An intensely physical duet, Wrongheaded is an expression of hope as Ireland enters brave new territory after it historic landslide vote to allow women the possibility of choice. On Wednesday 7 November, Australia-based choreographer Liz Lea brings members of MDI’s 50 Moves class (for female dancers over the age of 50) on stage as part of RED. An undeniably powerful, intimate and autobiographically revealing work, Lea considers the potentially embarrassing subject of endometriosis through dance. Wednesday also features Northern Dance Platform, a collection of work by female artists from the North. Dance artists Andrea Buckley (Wirral) and taciturn (Liverpool) question space, identity and the sharing of individual stories alongside Edinburgh-based Claricia Parinussa. Each with their own distinct contemporary style, these pieces combine original and thought-provoking choreography, with taciturn’s Façade featuring the company’s trademark dark humour as it interrogates how easily we fool ourselves into ignoring everyday problems. The triple bill opens with a performance by AbouTime, a piece based on a women’s suffrage march. The creative work of Black women in dance – and the wide-ranging influence of the African diaspora – is firmly centre stage for Cultiv8, a special day-long event on Thursday 8 November. Cultiv8 features a workshop from Uchenna Dance and a fascinating afternoon discussion, Empowered Pioneering Black Women in Dance, led by five leading female dance practitioners, and culminating in a series of stunning and thought-provoking performances by three emerging performers – Claricia Parinussa, Nafisah Baba and Charlene Kaliyati, taking the temperature of Black dance in the UK today. Uchenna Dance then take to the stage that evening for a special performance of The Head Wrap Diaries at the Capstone Theatre. Set in a South London hair salon, three fierce, clever and witty female characters take the audience through stories of community, heritage, womanhood, friendship, and most importantly, hair. Finally, ViTAL! returns to LEAP for the third time, featuring work from MDI’s own 50 Moves and Men!Dancing! as well as invited groups and artists from across Southport and Knowsley. 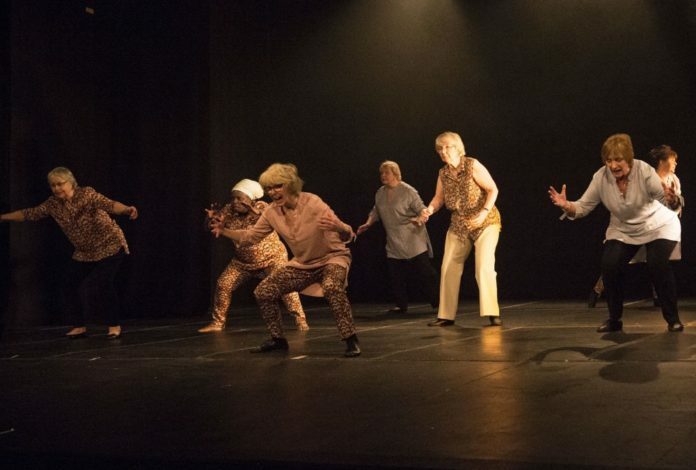 Taking place at the Capstone Theatre on Sunday 11 November, the event celebrates the continued need for movement and expression as we age – a topical issue given the cuts to funding for traditional wellbeing practice. LEAP is one of the most anticipated dance festivals in the UK, bringing 10 days of exclusive dance to the Liverpool City Region. The 2018 festival coincides with the 25th anniversary of Merseyside Dance Initiative, one of the UK’s leading strategic dance agencies and which programmes the festival.